Triggers are business rules you define that run immediately after tickets are created or updated. For example, a trigger can be used to notify the customer when a ticket has been opened. Another can be created to then notify the customer when the ticket is solved. Note: On Essential, you have a limited selection of conditions and actions to choose from when creating or editing triggers. For an overview of triggers, see About triggers and how they work. For a list of default triggers, see About the Support default triggers. For information on editing, cloning, deleting, and viewing the revision history, see Managing triggers. All of your available triggers can be managed through the Triggers page. From here, you can browse, sort, reorder, and filter your triggers. Triggers are divided by activation status. The default view on the Triggers page is the list of Active triggers. You can view triggers that have been deactivated by clicking the Inactive tab. For more information on activation status, see Deleting and deactivating triggers. All triggers containing the search term appear in the list. The search term is highlighted in triggers not using placeholders for the search term. 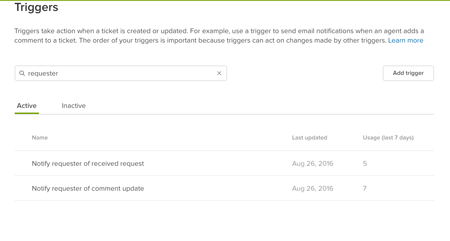 To help you get started with triggers, Zendesk provides you with a standard set of triggers and mail notifications that are best practices in a typical ticket workflow. You can view a list of these default triggers in About the Support default triggers . 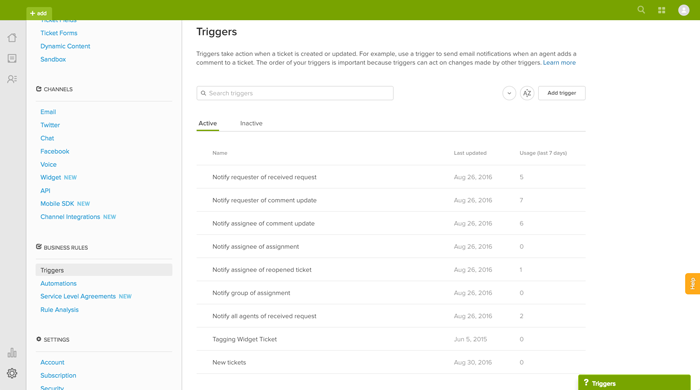 To view these triggers in your Zendesk, select the Triggers page. You can select Edit to see the conditions and actions that have been defined for each trigger. You can use these triggers as they are or clone them to make copies that you can modify and repurpose. You can also edit these triggers but it's better to clone them and make changes to the copies. You can then deactivate these Zendesk triggers if needed. You can create triggers from scratch or create copies of existing triggers and then modify and use them for some other purpose (see Editing and cloning triggers). All triggers are composed of conditions and actions. Conditions set the qualifications needed for the trigger to fire and actions represent what will be performed when those qualifications are met (see Understanding trigger conditions and actions). In other words, if the conditions are true, then the trigger will perform the actions. This section will inform you on how to set up your conditions and actions for a new trigger. Enter a name for your trigger. Your triggers should follow a consistent naming convention, in case you have to search for them later. Click the Add condition button under Meet All of the following conditions and/or Meet Any of the following conditions. If you add conditions under Meet All of the following conditions, all of the conditions must be true for the trigger to fire. If you add conditions under Meet Any of the following conditions, one or more of the conditions must be true for the trigger to fire. 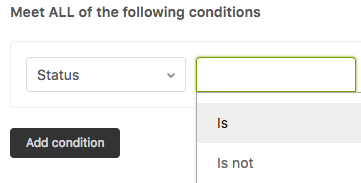 Select a condition from the Conditions drop-down list. See Building trigger condition statements for a list of the available trigger conditions. Note: It is recommended to keep your trigger statements simple. The more complicated a trigger is, the harder it will be to troubleshoot and maintain. A field operator will determine the relationship between your condition and its value. For example, if you select the field operator "Is", your condition will need to be equal to the value. Different conditions will contain different field operators. Select a value. Each condition contains a unique value (see Building trigger condition statements). After you have added all of your conditions, click the Add action button under Actions. Select an action from the drop-down list. See Building trigger action statements for a list of the available trigger actions. Enter the action information. Depending on the action you select, you will be required to enter different information. For example, if you select the "Type" action, you will need to select a ticket type. Your new trigger is added to the end of the list of triggers. You can reorder the list of triggers (see Reordering triggers ) or edit any existing trigger (see Managing triggers). In the list of Trigger Conditions above, I see "Organization: Custom fields Custom organization fields are available as conditions." However, having created a custom Organization Field, I actually don't see this available in the list of Trigger Conditions. What's going on? About the field: "ticket: comment text..." there is a way to choose exactly few words and not only one or one of these words. I mean for exemple: add a tag if in comment text is: "topic: other"
The tag have to work with this exactly sentence, and not if he find one word like that in the comment. There is any possibility to do that? I would like to create an "Out of Office" checkbox as a custom User Field, which we would use on the Agents' users. Then a Trigger could send an out-of-office email to the current user when that person comments on a ticket assigned to an out-of-office Agent. However, User Fields are only available in Trigger conditions for "Requester: [custom field] is...". I'd love to log a feature request for a Trigger condition of "Assignee: [custom field] is..."
I want to set up a trigger based on the body of the email sent it, is this possible? Basically, I have marketing "trigger" words embedded in our emails, so if a ticket comes in responding to one of those emails I want it categorized correctly (have already set up the custom field for category). The subject lines of these emails change frequently, which is why I have embedded them into the body of the messages. Please advise thanks. I want to know if there is a way to prioritise somehow triggers, making something such as a precedence order. I've got a web service, which stores our Zendesk's tickets. We're recording each tickets' changes (status, assignee, etc.) using a datetime. That way, we can measure times assigned to several agents. Besides, we've got two triggers: one to make a call to store a change in our WS (when a ticket is updated, if I'm not wrong), and another one which measures time (when a ticket status get changed to solved). The issue comes when the measurement trigger runs, the other trigger is also run. We haven't any way to guarantee that the measurement trigger gets executed JUST AFTER the other one. 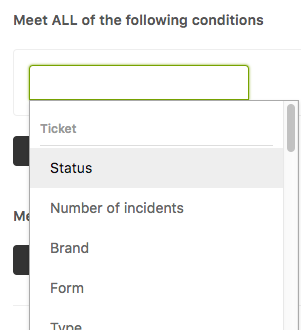 My guess is that Zendesk should provide us with tools creating a precedence order, or just by prioritising triggers. I hope I've explained myself right. @Jon. The triggers are processed in a op down order. When one is triggered, the whole list is then traversed again skipping any that have already fired, until all triggers have been checked. You cannot control the timing beyond that. Can I assume you do not have access to Insights or would prefer not to use it? Some people do use Insights to do similar measurements to you and I suspect there are some recipes in these forums. Could you modify your second web service to sleep for 30 seconds when it receives a request? Would that help? @Colin Piper thanks for your reply. We've got access to Insights, we'll look how to measure that. And yes, I can my WS to sleep for the time I want and, perhaps, it's the best choice. Thanks again! I'm trying to figure out a way for a trigger that sends a notification to the requester that the ticket has been updated - to also send the same exact message (email body) to the people who are cc'd. "You are registered as a CC on this support request (6345). Reply to this email to add a comment to the request." Additionally, people who are cc's on a request are not seeing all of the other cc's. When checking the status of the request via the profile (which imo is a lot more convenient than reacting to emails) it seems as if nothing has been done and request was just closed. Is there a way to send out public comments rather than email notifications via the trigger? but theres no option to pull requested time from the Ticket options, anyone else know another way to accomplish this? You can do this on the Professional plan or above. First create a Schedule for your business hours. Finally, include the action to CC an agent or set up a notification. Ahhh, no way to do this prior then. theres only 2 of us you see. So we are only on the starter plan. What's the best way to configure a trigger to email a manager whenever a custom ticket field is updated? I'm finding that my trigger is based on: when a ticket is updated, and the custom field is selected as option A, email the manager. However, if the ticket has multiple updates thereafter, the manager is notified each time. I just want the manager to be notified the first time the custom field is updated. My company has three Support plans that clients can buy, and the Basic plan does not include after-hours. I already have a trigger set up to set a custom Support Level field to Basic on any ticket for organizations who have bought that plan. What I'd like to do is expand that trigger to set a custom decimal field ("Hours of after-hours effort") to 0 on these Basic level tickets. However, I cannot get Zendesk to accept the decimal field as part of a Trigger action. Is this not a feature available in the Team plan, or am I missing something? Is there a way to stop a case from moving to the next trigger if a certain trigger was already actioned? Is there a way to create a trigger based on if the tickets has an attachment? We have certain tickets when we need to differentiate between tickets containing attachments and tickets that do not. How can I test or visualize the content of the json trigger? Has anyone ever used dates in there ticket forms to route tickets to various views? For example, in my forms, I want the end user to state the timeflow of the ticket, so if the request lies within the next 3 days then send to this area. That worked fine because you can do 'Date is within the next 3 days'. My following trigger I want to state that after if your request applies to more than 3 days from the current date to send to somewhere else. I can't see anywhere I could apply a a parameter for this - does anyone have any recommendations? Thanks! Having a hard time trying to create a certain trigger -- mind taking a look? Private Comment, something akin to, "Please check in with requester"
I could be wrong (it happens LOL), but I am thinking you need at least 2 steps for that. I am going to assume that you use Pending status which changes to Open status when the Requester End User replies. I am also assuming here that your business hours are 24 hours/day. Message Please check in with requester! Remove tags - 24_hour_update_needed <--- This will set it up so the process can run again on this ticket should it need to. Add a different tag if you want to report on how many tickets this occurs on. But still remove the original one! Don't forget to test this out!! Have a great day and my apologies for the long post. I hope you can help me. After I replied to one of our customers, I submittrd the ticket solved. Few hours after the customer responded but the ticket didnot reopen as expected, instead it automatically solved the ticket after the customer sent her reply. I checked the events but I do not see any agent who manually solved the ticket. There was nothing after the customer's reply but the tickets was solved and was added onmy solved tickets without me manually solving it. Can you check that the customer is an 'end user'? When an end user responds to a solved ticket, it is automatically set to an open status. But when an Agent or Admin responds to a ticket, the status is not automatically changed. Hey Honey - Do you have any triggers in place that might be impacting this? Can I do this through triggers or does this work different in Zendesk? Anything time-based would be something you use Automations for (usually). Automations run every hour, depending which plan you're on, but they are not necessarily at an exact time on the hour. i.e. It could be 2:07 or 2:10, not necessarily 2:00. That said, you can get close. In Automations, you have a lot of variables to choose from: Hours since Pending, Hours since Created, etc. Take a look here. Hopefully this will get you on your way! Thx for you quick response. Is there going to be a Application which we can find through the store or a update to the system which will allow this in the future? It seems like this is a default feature for a lot of ticketing systems. I am kind of curious why Zendesk doesn't have this build into there software.